Risoni with Smoked Salmon, Ricotta & Garden Veggies - Super Tasty! Risoni with Smoked Salmon, Ricotta & Garden Veggies - Super Tasty! Softly smoked salmon, creamy ricotta cheese, zesty lemon and fresh dill on a bed of risoni pasta. It’s official. This quick and easy weeknight dinner is a flavour sensation. Cook risoni in a large saucepan, according to packet directions. Meanwhile chop the woody ends off the asparagus and slice the asparagus spears into 3 cm/ 1 inch pieces, slice the zucchini into discs, and finely chop 2 tbs of dill. Juice and zest a lemon and set aside in a bowl. When the risoni has 3 minutes left to cook, add in the zucchini and asparagus. When the risoni and veggies are cooked, take the saucepan off the heat and strain. Put the risoni and veggies back into the saucepan and place on the stove over a medium heat. Stir through the spinach, lemon juice and zest, olive oil, and 1 tbs of dill. Stir until the spinach has wilted and all the ingredients are warmed through. 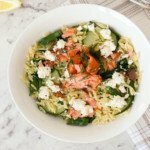 Divide the risoni between two bowls and top each with flaked pieces of the smoked salmon fillet, crumbled ricotta and the remaining dill. Boil water for pasta the You Totally Got This way. Boil your kettle, then pour the boiling water into a saucepan on high heat. You will have a pot of boiling water within minutes. Nobody needs to be standing around the kitchen waiting for water to boil – B.O.R.I.N.G! Leftover risoni? It’s traditionally used in soup. Why don’t you try this Italian Style Risoni Soup.